I can't believe it is the last day of this challenge. This has gone way better than my exercise plans. Thank you so much to Stacey and Ruth, Two Writing Teachers, for bringing together this community. My hope was to establish a writing habit, but more than that I have learned so much from all the participants. I've learned the world is full of stories, we just have to slow down long enough to capture them. What's next? My plan is to continue to write on Tuesdays by participating in the weekly Slice of Life. For the month of April I'm going to join Mary Lee Hahn and write a poem a day. Why not. "Fill your paper with breathings of your heart," William Wordsworth. It doesn’t seem long ago we dropped our oldest daughter off for college. Cortney has always had an interest in reading. Actually to say she has an interest would be a huge understatement. She is definitely #nerdybookclub material. When she was a kid I remember sitting for hours reading stacks of books with her from our local library. I enjoyed having an audience to try out new books for my classroom and getting authentic responses. I loved all the new books being published, she loved all the old stories. We both loved spending time together. It wasn’t long until she was reading on her own. It wasn’t anything to find her reading late at night. Many a morning I had to tell her to put her book down and get ready. It sounded so foreign coming out of my mouth as later that day I’d be busy trying to entice kids to pick books up to read. Since she was our first, I thought I’d screen every book before she read it, but by sixth grade it was clear I was not going to be able to keep up with her. Cortney has always loved reading and has shown an interest in learning other languages. I wasn’t too surprised when she told me she was going to major in English, but I was caught off guard when she added the Secondary Education part to it. It’s not that it should have really surprised me. Her dad and I are both teachers. It’s just that I guess I hadn’t really thought about it. Though her first love is American Literature she’s finding a fondness for British Literature as she teaches this semester. I still can’t keep up with her reading or knowledge of literature. I read “pop literature.” I am most interested in reading what everyone is talking about --- mostly so I can talk about it. I’m in love with poetry, but she didn’t find much to love about it until learning to read it in other languages. I can’t imagine. I suppose her love of literature comes from her dad. He is always sitting with a book in his hand and enjoys many of the same genres she does. Though it seems only yesterday we first dropped her off at college, it has been four years. She will graduate in May and is currently completing her student teaching at a high school in North Carolina. For spring break, I decided to drive down to see her. I wanted to see her school, meet her cooperating teacher, and check out where she has been staying. You know, everything needs mom approval. On Friday I walked into her school after her day of observations and teaching. The school was full of students exiting for the weekend. High schools are always so much bigger and busier than elementary schools. Being an elementary teacher myself I was excited to see desks in groups, sentence strips on the walls, artifacts from technology projects and many examples of visual learning. There was obviously life in the classroom where she and her cooperating teacher work every day. Today we wandered around the city. We’ve eaten at local restaurants, walked around the area, and been to the zoo. As we walked by a sign near a North American stream exhibit that read “Stream of Consciousness” she made her high school English joke. I made a first grade joke as we went by the sign that said “A Mudder’s Love” near a bridge filled with the homes of mud daubers. It is still fun to spend time with her. At first, when she told me she was going into education I had mixed feelings. The climate isn’t the best right now for educators. I worried that she wouldn’t be treated the way she should be. I’m her mom after all. Mostly, however, I was glad to know she’d be joining a profession her father and I have loved so much. Who else can go to work every day and say they love what they do? Who else can go to work every day to spend time around such fabulous people? Who else can go to work every day to talk about learning and books? I like thinking that someday she might inspire others to enjoy books as much as she does. I have a lot of work to do to convince the muse I am serious. Here's today's attempt. My own children make fun of me for my first grade sense of humor. Apparently, my jokes are't really as funny as I think they are. It occurred to me that my children may be right. Perhaps I have been living in a first grade world too long. 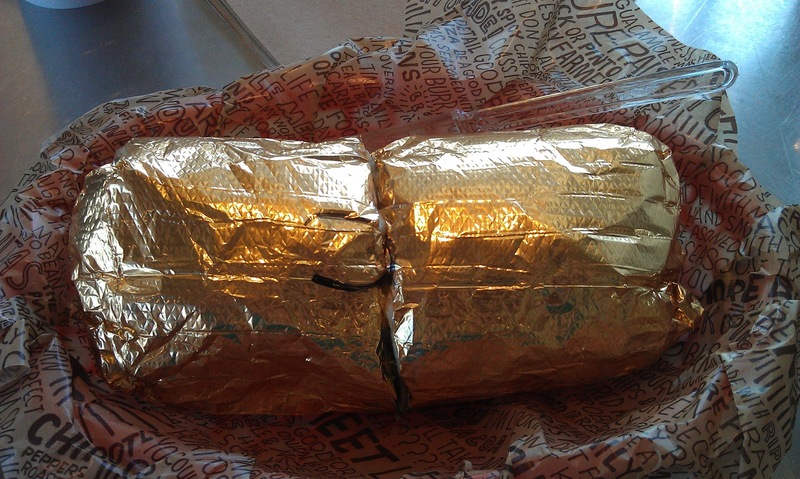 As I was sitting at Chipotle for lunch I started to think about how much I love Chipotle. As I sat there and thought about it I began to realize that the best things in life start with ch. It's true. Let me show you. So maybe my children are right. Perhaps all of my years teaching first grade have finally gone to my head. Oh well, if I'm going to be like someone it might as well be first graders. They truly know what's important in life. I found this quote by Drew Lamm on Ralph Fletcher's website, "I get my ideas from living my life wide-eyed and awake. I sit on the edge of chairs. I pay attention wherever I am." That's really the hard part ---- pausing enough to pay attention. Then, in my case, remembering to write it down quickly before it slips away. I have noticed many of the writers in this challenge using dialogue to tell their stories. I always enjoy those stories as I feel like I'm right there with the author. I thought I'd give it a try in this slice from the other day. I placed my purchases on the small counter. I'd been shopping for awhile and, after some deliberation, had settled on a gift. The woman glanced at me and smiled as she arranged the items to ring them up. "May I have two gift receipts," I inquired, a little proud of myself for remembering before she finished my order. "This is a gift for my mom and I want her to be able to return it if she doesn't like it." Now the woman took a second look at me, "She'll like it because you got it for her," she assured matter-of-factly. "Moms like everything we do them for them," she added, suddenly certain of her words. I thought for a moment about the gifts my own children had given me: the garden stones they made, the drawing when they were little, the tree for our flower bed, the first knitted scarf. I loved them all because they gave them to me. I nodded in silent agreement. The woman proceeded to check out my items as she went on with her story, "When I was in college I got a plant for my mom. It looked rather sickly when I gave it to her. The leaves were beginning to die and the plant was rather small. It was all I could afford at the time." She shook her head a little as if now embarrassed to have given her mom something so close to death. "She, of course, loved it. A few weeks later I got a thank-you note and picture from my mom. It was the plant, and it was beautiful. I couldn't believe it was the same plant I had given her a few weeks before. It was healthy and very alive." This woman who was checking out my items was here and there at the same time. Her face lightened in the memory of it all. She began folding my items and placing them into the bag. I stood smiling at her story, the understanding that moms do like everything we do for them, and the pure joy of realizing that stories are everywhere if we slow down to listen to them. I looked at her as she continued miles from the register. "Now when I go to visit my mom," she laughed, "those flowers fill the flowerbeds around our house. They've taken over, but they're just lovely." I reveled in her story for a bit; the stories that sometimes escape us if we don't pause long enough to get them down. "Here are your gift receipts," she inserted as she reached across the counter to hand them to me. I thanked her grateful for the story she had just shared. I then smiled, took my purchases, and walked away playing her story over and over in my head. Glad to have had the time to slow down enough to listen. Today is my mom's birthday. Happy birthday, Mom. "You can't say, I won't write today because that excuse will extend into several days, then several months, then… you are not a writer anymore, just someone who dreams about being a writer." Dorothy C. Fontana Well, I thought posting during spring break would be easier. After all, I'm constantly out and about with plenty of possibilities for writing. However, it's actually a bit tougher than I anticipated. Carving time for writing in the middle of fun is a bit of a challenge. My family just loves free stuff. My grandfather used to joke the best way to get everyone together was to offer a free meal. Of course, who could resist a meal cooked by grandma? My dad is a champion at managing free coffee at Starbucks. I'm not sure how he does it really. It seems they are always waiting on a new pot to brew when he arrives. I myself just managed a free oil change at my service station. Free makes everything more enjoyable. A few years ago my husband and I went with my brother and his wife to Charleston. It was a beautiful city rich in history. Quickly I learned my sister-in-law, Lisa, had a special gift. It seems she was the champion of the free sample. She'd go into candy stores, bakeries, ice-cream shops and practically fill up on the free sample. Actually it got a little funny as we went into a candy store and I was making a purchase that was smaller than her free "sample." I realized it was a bit of an art, enough interest combined with a little small talk seemed to score the best free samples. This week my brother and his wife went back to Charleston for a few days. Of course, I'm getting constant updates on the free samples they are finding: cobbler, cookies, fudge, ice-cream and free breakfast. It seems Charleston is full of free finds. While they are off in Charleston, I'm visiting with my mom. I'm taking this contest to heart. I've responded with a picture of free raspberry cheesecake, free evening entertainment (my brother's kids who are staying here too), and free Jerry breakfast (which is an omelet that is to die for). Today I traveled the Country Music Highway as I headed south for spring break. For me, the Country Music Highway provides a little entertainment. Though I'm usually a Top 40 gal, I crank the country music all the way down the Country Music Highway. Singing at the top of my lungs passes the time as I try to match the music on my iPod to the singer at that part of the highway. So, I thought I'd use the "spine poetry" idea for country music (hopefully you've seen the poems written by arranging the titles on book spines to make a poem). I decided to take the titles and turn them into a traveling poem. Let's just say the first country music poem I wrote wasn't appropriate for the internet. ;o) Here it is. I wanted to put the name of the singer/group beside the title to give them credit. SOLS #26: Are You In? 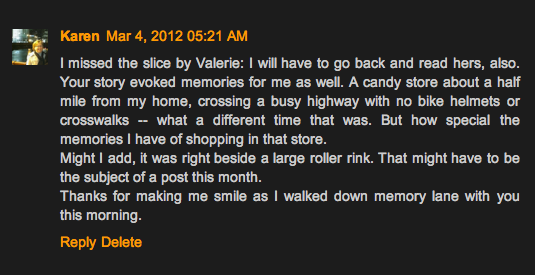 This morning I awoke and started to read through some of the early slices. It's spring break after all, so I'm in SOLSC heaven. I was a bit shocked when I got to Kathleen Gillis's post about blogging, What Is the Sound of One Blogger Blogging?. Kathleen is wrestling with life after this challenge. Honestly, I felt a little sad. 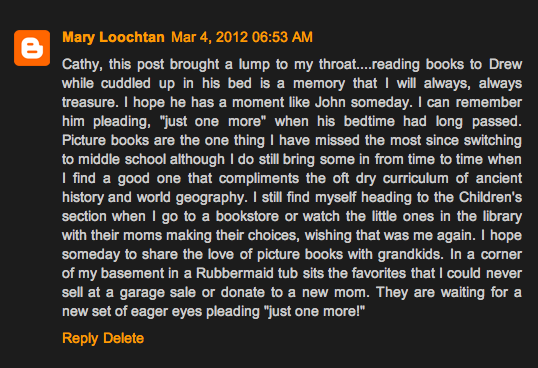 I hadn't really thought about what might happen to some of the blogs I've been enjoying AFTER this challenge. I just assumed they'd always be there. So today's post is my reflection on blogging. Thanks, Kathleen, for the inspiration. What brings one to this blogging madness? I first began blogging a few years ago at Reflect and Refine: Building a Learning Community. I suppose it was a combination of conversations with friends and spending time on Twitter that pushed me to begin. As I spent more time on Twitter I'd find that sometimes conversations would begin, and I had more than 140 characters to say about them. Imagine that. Then last year I started this blog, Merely Day by Day. It was an attempt to join the 365 daily photo challenge. Yes, I just love a challenge. Well, let's just say that went about like my plans to exercise. Not. So. Well. Looking back I see I made it 58 days which is better than I remembered. 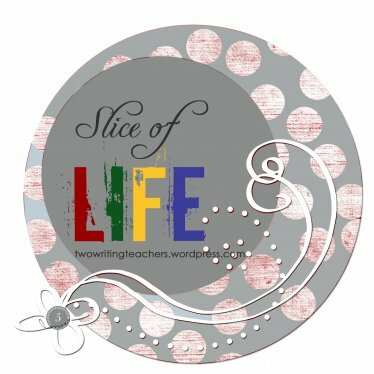 When the Slice of Life Challenge started I decided it was time to rejuvenate this blog. The way I wanted to participate in this challenge didn't really lend itself to the writing on my other blog. This has actually worked out perfectly. So what's my plan? I have enjoyed this blog for trying to improve my writing ---- which still needs A LOT of work. If I have heard the rumors correctly Slice of Life will continue weekly on Tuesdays. I plan to post here at least that often. I have also heard rumors of an April Poetry Challenge. (Yes, I apparently hear a lot of rumors.) When I figure that challenge out I hope to participate here next month --- just to keep life interesting. A little poetry is good for the soul. That is my plan, but honestly (and I wish this was at the beginning of the post because I want everyone to read it) I hope everyone else will continue to blog. I've come to enjoy the writing of so many people participating in the event. I would miss not being able to stop by to read their thoughts. This challenge has let me put stories with the people I have followed on Twitter, blogs, and in the cyber-sphere. The thought that everyone might disappear on April 1st is not something I want to consider. Are you in? When I started this challenge, my original intent was to get back in the habit of writing AND to try some of the types of writing we create in our classroom. I've been fascinated by literary nonfiction. I've been wanting to give a piece of literary nonfiction a try. Tonight I'm collecting interesting facts about herons. Maybe I can turn this into a piece of literary nonfiction. Mandy, at Enjoy and Embrace Learning, gave me the final push with her post about manatees. In the last several years I've noticed many more herons in Ohio. Now it is possible they've been this common all along. Perhaps I've just started to take note of the bird as it gracefully moves through the sky. However, I'm thinking it is quite likely there is a change in the number of herons in our habitat. When I see a heron it is always alone. Herons wait patiently in the shallow parts of water for prey to mistakingly stop by. Indian Lake has a lot of herons. I don't remember seeing herons as a child. The heron appears to be flapping its wings slowly, but yet covers a distance quickly. Herons have long skinny legs. Occasionally, when excessive water makes a temporary pond in our backyard, a heron will be spotted. Herons appear to have a long wingspan. Has the heron population increased in Ohio in recent years? If so, why? What are the migration patterns of herons? 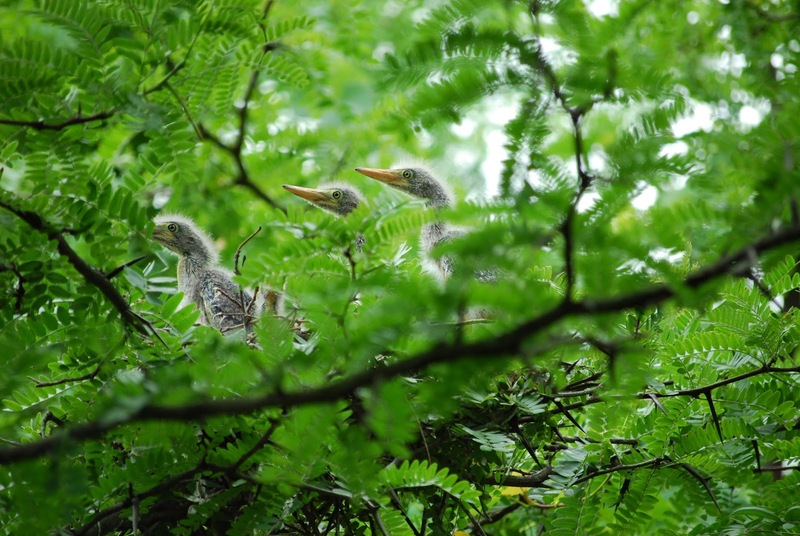 Do herons in Ohio always nest in a rookery? Did we have a heron nest in our field last summer? 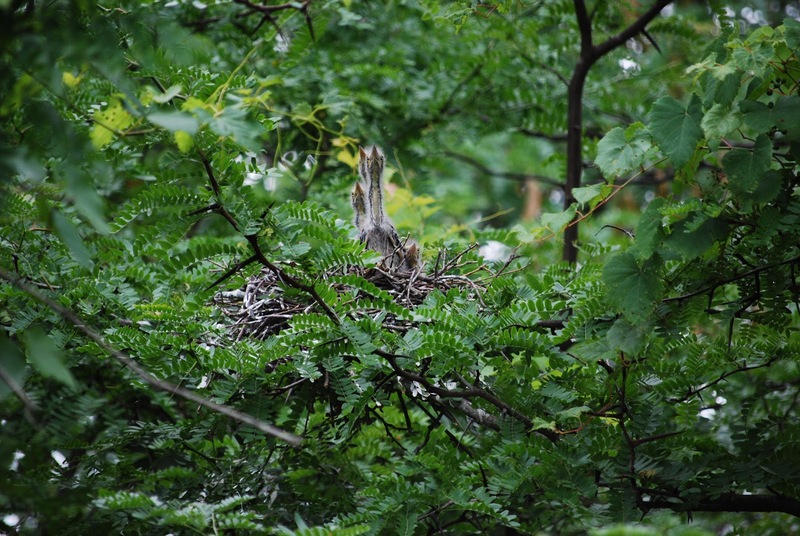 Do herons return to their nests? What do herons eat besides fish? What does its foot like? Does it use it help capture prey? The great blue heron can stand about 4 feet tall (about the size of my first graders). The heron only weights 5-6 pounds. The great blue heron is the largest heron. The plumage on the heron is black, brown and white, but appears bluish-grayish. Herons make a rough croaking noise. Herons catch their prey with their long bills. It's wingspan is 65-80 inches (as big or bigger than a person). Herons hunt day and night. They have special "rod-type photoreceptors" that help them to see at night. Herons eat fish, amphibians, reptiles, small animals, and other birds. The heron is black, brown and white though it appears bluish-gray. The males gathers nesting material and the female builds the nest. The blue heron's foot is 6-8 inches long. Stop here to for a look. Stop here to listen to the heron. "The Great Blue Heron", The CornellLab of Ornithology. "Great Blue Heron," The Ohio Department of Natural Resources. "Animal Tracks - Great Blue Heron,"
"The Great Blue Heron," The Ohio Nature Blog. In addition to the Slice of Life Challenge at Two Writing Teachers, I'm finally joining the Poetry Roundup hosted at A Year of Reading. *If you're reading this poem from a mobile device turn it sideways. But a week without school? "How will we do it?" The tweens think with glee. The sound of happiness rumbles. But the students do not look back. SOLS #22: Your 2¢ Worth? Being a part of a writing community that learns together from places very much apart is new to me. However, I have felt such a part of this community as we move from blog to blog - or slice to slice - to learn from one another. Reading, writing and commenting are all important in our work together. "The short songs we need now are about to be written by voices we don't yet know. We will need to be eloquent listeners to invite these songs forth, and share them all around." Kim Stafford, The Muses Among Us. So here we are. Maybe I should say, SO HERE WE ARE!! Twenty-two days of writing under our belts. Twenty-two!! I find it intriguing that today is the 22nd --- two 2s (2-2). So...I'm going to talk about our 2¢ worth in commenting. OK, I know I'm pushing it here. That was probably worse than the segue on the evening news, I know. Writing, for me, has surely had its ups and downs. Tonight I don't want to talk about the writing. I want to talk about the thing that has probably mattered the most in keeping me motivated. Tonight I want to talk about commenting. This process has taught me some things about commenting that I think will help me as I confer with writers in my classroom (and when I teach students more about commenting on blogs). 2. Celebration (or the "Yay!" 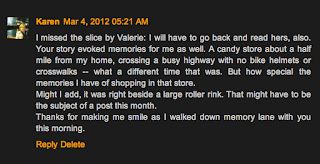 Comment): These are the comments in which the reader just celebrates with you. Picture an audience and a standing ovation. 3. Connections (or the "Me Too" Comment): Many of the comments I have received have been comments in which the reader identifies with my post. Sometimes I have reminded them of something they had forgotten, they can empathize with my situation, or something similar has happened to them. These are the comments that connect us together and help us to realize we are not alone. 4. Affirming (or the "I Agree" Comment): These are the comments in which the reader affirms our thinking. 5. Growing the Conversation (or the "I've Been Thinking" Comment): These comments are also helpful as they help build upon the thinking of the writer. In these situations the reader adds to what has been posted. After reading a post, the reader has had a little more to say about the topic to extend the thinking. These comments are conversational in nature and are always interesting to read. 6. Questioning (or the "I Wonder" Comment): These are the comments in which the reader is wondering something about what has been written. The great thing about blogging is you can really just ask someone to tell you more or share something you've been wondering yourself. 7. Craft (or the "It Really Worked When You..." Comment): These comments have been very helpful. These are the comments in which the reader has noticed something about the writing that has caught their attention or really strengthened the piece. Sometimes they are comments about the structure, voice, or crafting technique of the post. Sometimes the comments are about the words used in the post. Perhaps the reader has discovered interesting vocabulary, repetitive words or phrases, or a line that has caught his/her attention. These types of comments help me as a writer. It's getting near the end of this challenge and commenting is getting harder. Let's face it, we've been devoting hours just to compose a post, then we go read, and try to leave comments. I know I've found the comments to be so helpful, not only in motivation, but in helping me to improve the craft of writing. I just want to thank everyone who has taken the time to leave such thoughtful comments. I can't even begin to tell you how much they are appreciated. Everyone should have grandparents to spoil them. Grandparents always have time to just sit and enjoy our company. I was lucky to have four amazing grandparents. They were actually the perfect mix. It was like I had the best of four worlds growing up. It was obvious my grandma loved her role as grandma. She'd had grandparents that were near and dear to her heart and she wanted the same for us. When I was younger we would spend one week each summer with her. She lived about an hour away so we'd jump in the car with our suitcases packed too excited to sit still. I'd try to fall asleep as the time went much faster if I could. I'd wake up and find us in the driveway. There were so many fun things to do at Grandma's. We would play games day and night. Old Maid, Kings on the Corners, Thirty One, Aggravation and Spoons were among our favorites. Grandma would play with us well into the evening. Games always were full of laughter. Every night Grandma would get tickled and start laughing. Before we knew it her laughs turned into snorts. Then we were all laughing uncontrollably. Grandma was an amazing cook. She rose early so we usually ate breakfast before eight o'clock. She would make waffles or pancakes for us to devour. Lunch soon followed and then dinner with more courses than I was used to eating. After a couple of days I was quite sure I couldn't eat another bite, but who could resist Grandma's delicious cooking? Most of all, I will remember my grandma for picnics. Every morning she'd wake up early to pack her coca-cola cooler with peanut butter sandwiches with thick slices of butter, cheeses, some chips, and watermelon. She'd pack the car with everything we'd need for our afternoon out. We always looked forward to the treats that awaited us when it was time to eat. Every day was a different adventure. I didn't know it at the time, but Grandma was taking us to the places where her stories nestled close to her heart. 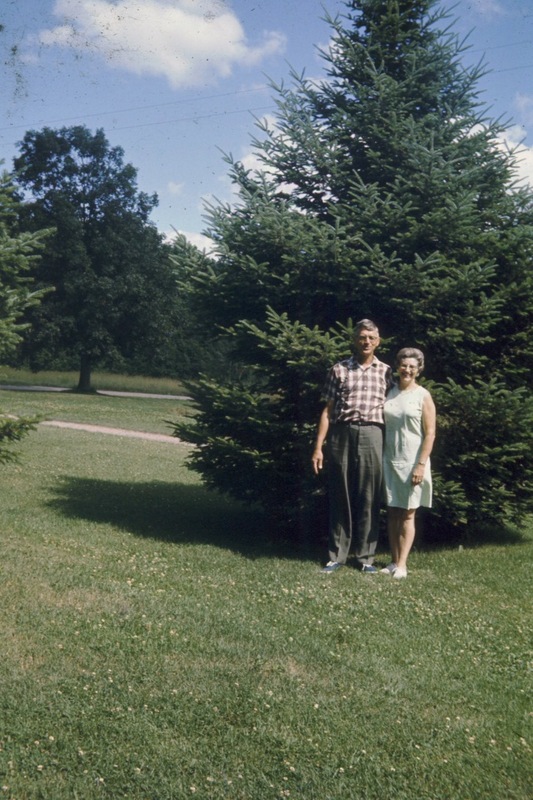 We'd go to Dawe's Arboretum where her favorite aunt and uncle used to live and take care of the land. We'd go to Rising Park to climb the mountain (which as I've grown up I've discovered is hardly a hill) near where she lived. Grandma would choose one of the hotter days to go to Buckeye Lake, close to her hometown, where we would swim and stop for ice-cream on the way home. Everyone should have grandparents to spoil them. Looking back I remember those times fondly. Today, on my grandma's birthday, I smile to myself with the stories of the times we spent together nestled close to my heart. "Now, who knows if any of this is usable material? There's no way to tell until you've got it all down, and then there might just be one sentence or one character or one theme that you end up using. But you get it all down. You just write." Anne Lamott, Bird by Bird. That's my plan for today - a spring celebration. I often wonder why I live in Ohio. As I travel the United States and see the beautiful mountains, the glorious oceans, the winding rivers, the rolling hills, the blue skies, I wonder why I live in a place where the skies are gray and the land is flat. I wonder why I live in a place where the cold winters seem to go on forever. Where, in the long months of winter, temperatures rarely get above freezing and snow has a way of slowing things down. Perhaps on days like today I start to understand. This evening I came home to sit on my back patio. It is unseasonably warm for this time of year. In these days one can visibly see the transition from winter to spring. 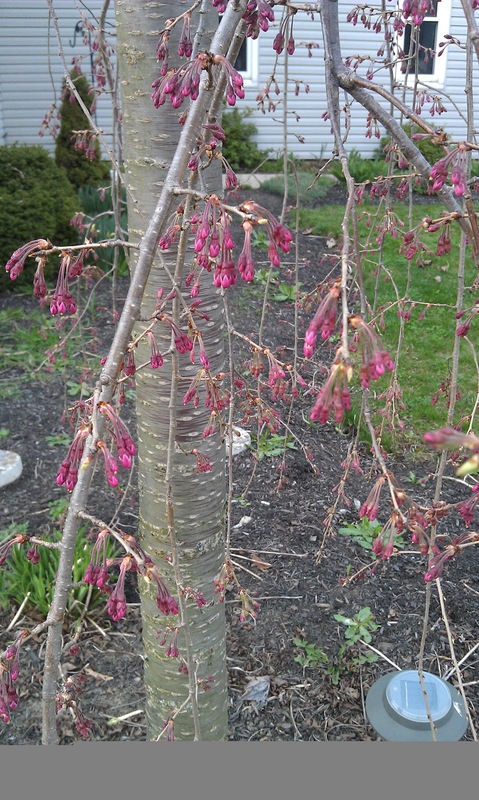 The trees with their bare limbs begin to show signs of life. 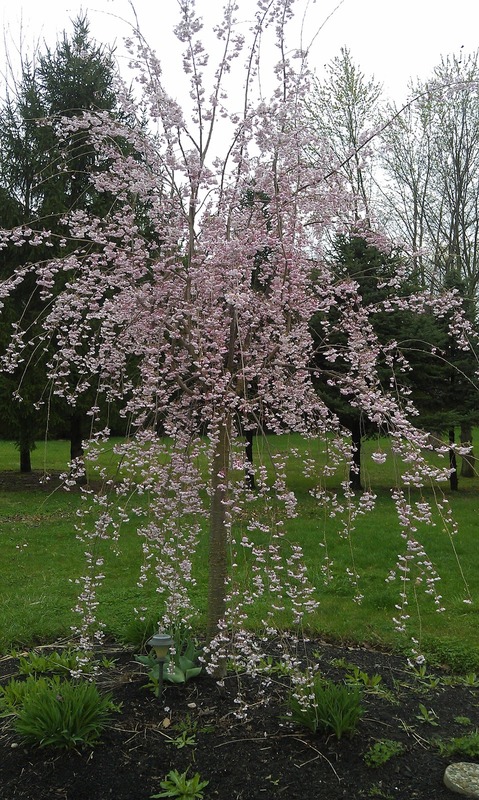 The weeping cherry in our front yard has flowers wrapped tightly waiting to burst when the time is right. The white flowers of the dogwood have opened as one of the first hopeful signs that we have placed winter firmly behind us. The brown grass of winter is gradually being overtaken by the green grass of warmer days. The dried leaves of fall can be found entwined in flowerbeds where they have kept the fragile contents warm through the long cold months. 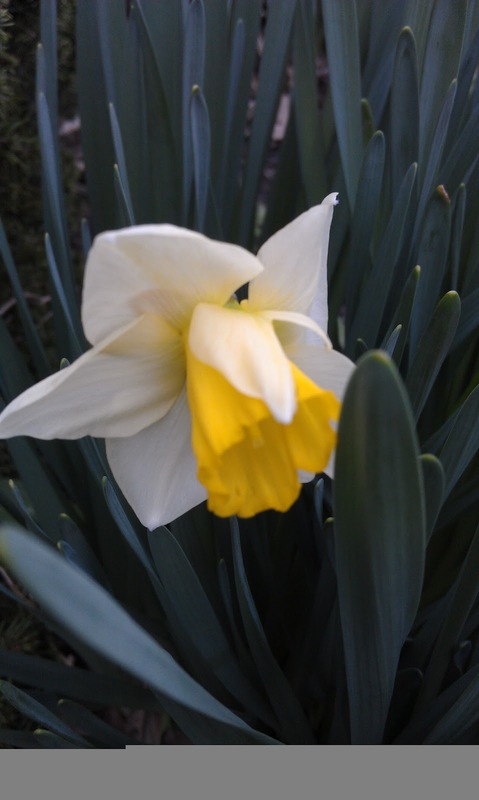 The daffodils begin to burst open and the hyacinths begin to flower. The tulips are peeking above the ground now to let us know that they are next in the display of spring fireworks. The birds chase each other from tree to tree around our backyard. There's a constant chatter in the air as animals, birds, and insects begin to appear again. I've heard the woodpecker busy in the woods nearby. I've seen the heron standing like a statue in the shallow water that collects this time of year in our far backyard. I've heard the cardinals calling to each other as they move from tree to tree. Everyone joins in a never-ending chorus that celebrates the coming of spring. I sit here on my patio with the sun slowly sinking behind the field with its rows of dried corn stalk still left from the harvest of the previous fall. I watch the days slowly slip from winter to spring. Perhaps this is why I live in Ohio. I've learned to mark time by the changes I see around me as the seasons pass. I know the farmer will soon be busy plowing the field to plant new crops. As we close the door on winter, and step carefully into spring, I know the sun will shine a little more. There will be many more days for me to sit on my patio and enjoy the beauty that surrounds me. In Writing Toward Home, Georgia Heard gives us this advice in trying to establish a habit of writing, "What are the rocks in the currents of your writing life? What obstacles keep you from writing? Becoming aware of what is blocking you sometimes leads to a solution." Tonight the rock in my way is my book which is nearing the end. But my book is calling me. SOLS #18: Who Would've Guessed? Ralph Fletcher, in Breathing In Breathing Out, reminds us about a notebook, "It serves as a container to keep together all the seeds you gather until you're ready to plant them." Today is one of those days I struggled with an idea for writing. It's been a busy weekend and I haven't had time to spin new ideas around for awhile. The real challenge in this 31 day event is letting writing go to the world well before it is ready. It is much better to capture these ideas in a notebook and wait for them to take shape. Today we were up at 5:30 in the morning. Yes, it is Sunday. No, I do not believe in getting up before six in the morning. It is a personal rule of mine. Nothing can possibly be more important than sleep. But I am up this morning before the sun is in the sky packing sandwiches. Thankfully I quickly got the pot of coffee brewing as I will need it. The darkness doesn't help to motivate me as I put the finishing touches on packing the cooler. The cooler is placed in the trunk with chairs and other survival equipment for my day as a sports' mom. Growing up if anyone would have told me I would spend a good portion of my adult life on bleachers watching sporting events, I would have laughed until I cried. I didn't play sports when I was younger. I didn't even watch sports when I was younger. I grew up in a football town and had absolutely no interest in watching players run a ball back and forth down a field of pristine green. If one of my kids isn't playing, and I'm at a sporting event, it is most likely a social decision. If I'm at a sporting event I'm more likely to be able to tell you the stories of the people around me than the score at any given moment. I suppose since I am married to a coach one would assume I would watch sporting events. That has been a factor. So has the fact that we have three kids and each one has participated in several sports. In the fall I am usually a soccer or volleyball mom. In winter I can be found at basketball games. In the spring it has been tennis or more volleyball. Thankfully baseball or softball never became an interest for my kids. I have always admired parents who will sit through nine innings of a game, two to three nights a week come rain or shine. 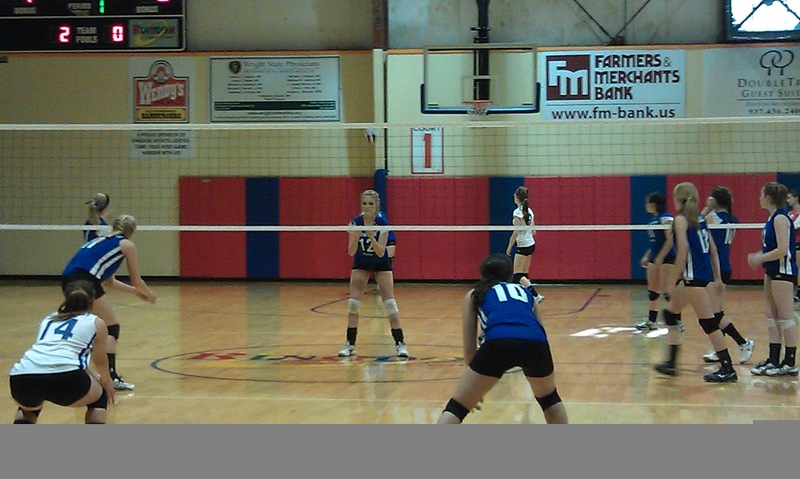 Today it is off for a day of volleyball, by far my favorite sport. Honestly, it is. Thankfully we are only chasing one sporting schedule now. Watching the kids play has always made all the time worth it. They've learned a lot of lessons playing sports and made many friends. I've enjoyed the time hanging out with them, and surely I've learned a little about sports along the way. I'm not a fan of getting up at 5:30 in the morning to attend a sporting event. I'm not a fan of getting up at 5:30 in the morning for anything, but I know some day I will miss this madness. You might have heard John Cougar Mellencamp sing, "I was born in a small town. And I live in a small town. Probably die in a small town and that's probably where they'll bury me." Every time I hear that song I feel like it was written for me. You see, I have lived in my small town since before I can remember. All of my memories are of this small town. Growing up I remember walking to school from my grandma's house everyday as she lived in the same small town, and returning there each afternoon to hangout until it was time to go home for the evening. I remember going for ice-cream at the local dairy queen, spending summers swimming at the pool with friends, and riding our bikes around the block for hours everyday. In our small town you could ride your bike into the local dime store for candy or to the drugstore for a fountain pop or milkshake. Even at the age of eight you knew everyone was watching out for you. In our village people just did that. If you needed help there was always someone who would be right there, if you caused a little trouble you knew there would be someone finding your parents to let them know. When I was in high school I was certain I was leaving this small town. Though I loved my friends, I'd been sitting in classrooms with the same students for years and years. My dad had sat in classrooms with many of their parents. There were only a handful of classes offered and it seemed opportunity was on the other side of the creek that marked entry into our small town. I counted down the days until I would no longer live in this small town. For years I had seen the same faces. I knew all the stories. So it was with great excitement I headed off to the university each day where I disappeared in crowded lecture halls of students. I loved the feel of driving out of my small town every morning and driving toward the big city. The skyscrapers I passed on my way to college classes seemed like they held some magical secret that I should know about. The feeling of freedom as I parked my car on the large campus kept me coming back day after day. I was sure I would soon be finding a job and moving into the suburbs with their bigger schools and plentiful opportunities. Life has a funny way of teaching you lessons. It wasn't long until love and circumstance landed me right back in my small town, and I learned the value of all that had been in front of me growing up in our small community. Before I knew it I was living right across the street from where I was raised. Yes, RIGHT ACROSS THE STREET. I was teaching in the same small elementary school I attended. 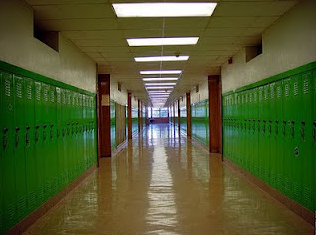 Yes, I WALKED DOWN THE VERY SAME HALLS. I was shopping in the same grocery I worked in as a student. Yes, THE VERY SAME GROCERY. I was sitting at events beside the very same people I went to school with years before. Yes, THE VERY SAME PEOPLE. And I was happy there. Now as I drive out of my small town every morning with others from my town that have learned that opportunity may be across the creek, but community is coming back into the still small village each evening, I notice the changes. The dime store where we bought candy as kids has been replaced by many an unsuccessful business venture. The drugstore has been replaced by a local doctor. The lot where the middle school I attended used to stand is now a green patch of land used for gathering during community events. Yes, the town has changed a little. I suppose our village status may be in jeopardy with the arrival of McDonald's and Family Dollar. Some things are still the same. People still drive to our small town for Italian Food from a long existing Italian restaurant. On Friday nights in the fall you will find most of our town cheering for our football team. You can still ride your bike around the block for hours and someone will still be there to help you if you need it. Of course, you will still hear our children saying, "I can't wait to get out of this small town." Some of them will move on. Some of them, like me, will find themselves right back here learning of the gifts that have unknowingly surrounded them all along. "Just start getting it down," Anne Lamott, Bird by Bird. Well, here we are past the halfway point. The hardest thing about this challenge is putting something out into the world every day. This needs A LOT of work...but I just thought I'd start getting it down. My alarm went off at six o'clock this morning. Slowly I put two feet on the floor still tired from reading Slice of Life posts well into the night. I walk into the foyer with eyes half open. I first notice a laundry holder resting by the dryer. "That's strange," I think to myself. I try to wake up to make sense of the clues. I open the dryer to find my son's clothes inside. Still half asleep and trying to focus I think back. I had let the dog in for the night, turned off the lights, and locked up the house before going to sleep. I was up until after midnight and didn't hear him come into the house, but signs are everywhere. Still trying to put it all together I wander into the living to find my son's shoes and belongings on the floor. As I wake up it is beginning to make sense; surprised I didn't hear him I check for the final sign. I walk across the kitchen floor and into the dining room. As I walk into the dining room I glance at the table to find the snack basket is no longer heaping with snacks. The Doritos are gone. The Sunchips are gone. The Cheetos are gone. I'm sure he was amazed to find I had actually been to the store recently. The last few times he has visited there has hardly been a thing to eat according to him. The signs are all there, sometime in the night my son must have quietly arrived home for the weekend from college. I'm looking forward to coming home this evening to catch up with him. I'm sure the Fritos will be gone by then. "Come sit by the window and watch," my grandma would say after finishing the breakfast dishes. Grandma never left a job until it was done so dishes were washed, dried, and put away before we'd all gather around the table to birdwatch. After the work was complete we'd sit down at the kitchen table to gaze out the window into the backyard. Grandma had an amazing backyard with a rolling hill that was just right for racing, rolling, and playing. There were three old maples with their carefully shaped branches spaced the exact distance necessary for running bases. In the center of the yard was a bird bath with neat rows of marigolds planted carefully around it. We were sure Grandma's yard had been designed for kickball and other outdoor games, but Grandma was quite sure it was perfect for attracting birds. From the trees for nesting, to the birdbath, to the feeder always filled with food, her backyard beckoned birds to stop for awhile. 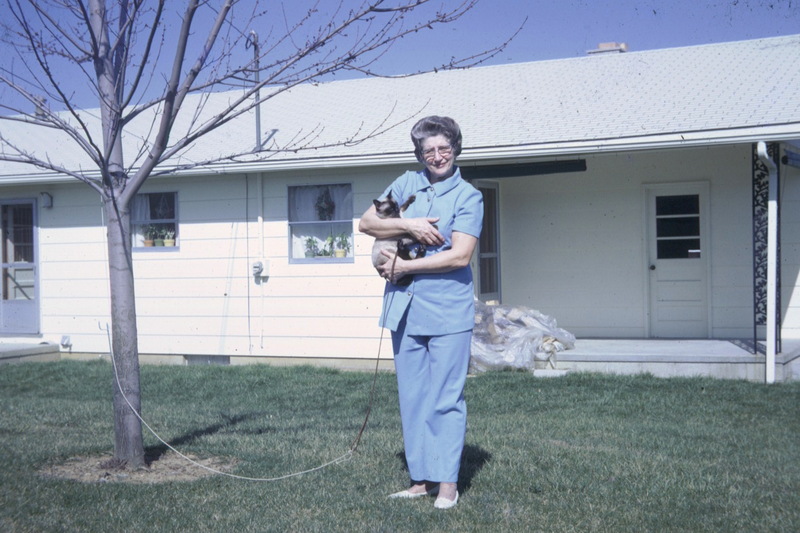 Whether it was winter, spring, summer or fall, Grandma thought it necessary to keep bird food out for the birds. This food attracted birds at all hours of the day. We'd pull up a chair beside Grandma in the morning to watch the birds slowly make their way to the feeder as the morning sun rose in the sky. There was something about this time that made even a wiggly seven year old want to sit still and watch. Some days the robin would stop by with its orange breast puffed out as if it wanted all the other birds to know it owned the feeder for now. The robins would bounce from the feeder to the ground to collect nourishment as they sang happily in their morning work. 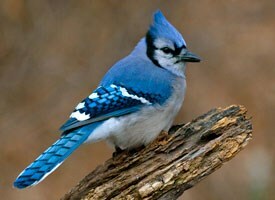 Some days the blue jays would arrive squawking loudly at the feeder. Grandma would comment in disgust, "Those blue jays are bullies. Chasing all the other birds away so they can have the food to themselves." I'd watch the blue jays swoop into the feeder. I never really understood how something so beautiful could be so mean, but it was true. Blue jays had a way of sending other birds back into the sky with wings aflutter. Though many other birds likely stopped by, I remember Grandma seemed the happiest when a red cardinal would appear in the yard. It would perch its feet on the feeder and enjoy the ease of gathering food in this backyard heaven. I'm sure Grandma spent hours watching the feeder when we weren't there keeping her busy. She knew a lot about birds and loved to tell stories about them. As the cardinal would arrive with its scarlet feathers catching our attention, Grandma would begin to search for its mate. The female, always close by, was usually harder to spot with her feathers dull in comparison to her brilliantly colored mate. As the brown begins to be taken over by green and the sounds of birds are back in our mornings. As the evening air warms allowing quiet moments on the patio searching for a variety of Ohio birds. I am reminded of these times sitting quietly at Grandma's table watching heaven through her kitchen window.